Barefoot Ken Bob Saxton, the shoeless sensei and a truly exceptional teacher, is barnstorming the U.S. this summer to give free barefoot-running workshops. i’ll be hosting him in Lancaster,PA before he moves on to the Univ of Delaware, New York, Harvard, and points beyond. It’s totally and truly free, although donations to cover Ken Bob’s travel are appreciated if you feel so inclined (Ken Bob insists that people donate only AFTER each workshop, and in whatever amounts they feel like). 2/ Every time i’ve disagreed with him, i’ve been wrong. After picking his brain for years, I had the chance to run with Ken Bob last winter at his home in California, and discovered that besides being exceptionally bright and encyclopediacally knowledgeable, he’s also flat-out funny, fun-loving, and super-friendly. 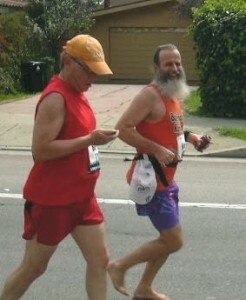 His summer tour is the chance to learn directly from the source of all knowledge when it comes to barefoot running. Long’s Park,Lancaster PA, Pavilion 2. Bob’s website so we know how many people to expect.